More than 20 million people board cruise ships each year to enjoy a little rest and relaxation. The lucky travelers liberally apply sunscreen before sunning themselves on deck, while the ship's intricate machinery chugs forward, propelling the vessel toward unknown destinations. Now, a University of Delaware start-up company, called RiKarbon, Inc., may have a way to make both of these activities greener. Researchers at RiKarbon are combining plant scraps and natural oils, through chemistry, to engineer a bio-based oil that can be used as a renewable alternative to typical petroleum-based resources used in everything from popular skin lotions and sunscreens to lubricants for shipping, agriculture, food processing and hydropower production, among other things. "If we can use renewable sources, it will minimize pressure on petroleum while reducing our carbon footprint and creating a sustainable use for enormous amounts of available biomass," said RiKarbon founder Basudeb Saha. According to a 2016 U.S. Department of Energy report, more than 130 million dry tons of biomass from waste resources go unused each year. 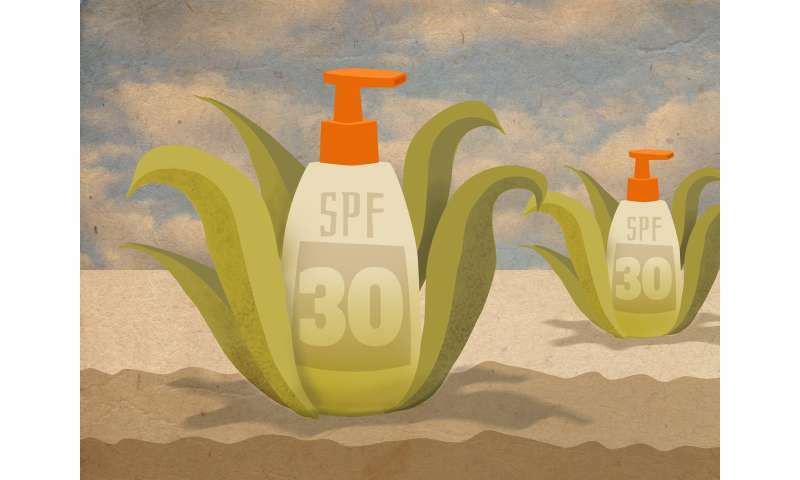 The focus on the cosmetics industry is borne out of the potentially harmful ingredients included in popular skin lotions and sunscreens to provide improved sun protection and other benefits. When washed off with water, ingredients that are not water soluble create pollution in our water streams that can be harmful to the environment. For example, sunscreen residue washed off in the ocean can affect the development of marine organisms, such as horseshoe crabs, and impair fragile ecosystems found in coral reefs. Consumer interest in reducing harmful ingredients linked to health concerns, in favor of safer, renewable ingredients, is also driving changes. "We seldom read any of the information around the products we use," said Saha, who also is associate director for research at the UD-led Catalysis Center for Energy Innovation (CCEI). "We're all ignorant to what's actually inside them, even though we make it a point to use sunscreen when we go to the beach and other places. If we can use our product to replace the harmful ingredients, we can help the environment and serve the consumer." An emerging area of use for RiKarbon's eco-friendly technology lies in lubricants—a $60 billion-dollar industry. Lubricants are used to keep bearings, gears, thrusters, engines and other mechanical parts running smoothly in everything from ships to wind turbines, airplanes, automobiles and agricultural equipment. "There is a big need for environmentally acceptable lubricants for applications where petroleum-based products can lead to environmental challenges that are costly to clean up," Saha said. According to a 2011 report from the Environmental Protection Agency, up to 16 million gallons of petroleum lubricants per year are accidentally released into the ocean due to leakage and the careless disposal of lubricants from marine vessels, cruise ships and hydropower production turbines. This is 1.5 times the amount of oil spilled in the 1983 Exxon Valdez disaster, where a shipping tanker struck a reef in Alaska's Prince William Sound, dumping 11 million gallons of crude oil into the water. The detrimental environmental effects on marine organisms and fragile ecosystems are significant, causing growing concerns and prompting the search for safer alternatives. The startup company grew out of Saha's work at CCEI, an energy frontier research center housed at UD and funded by the Department of Energy, that focuses on renewable energy technologies derived from non-food biomass. "Over the last decade, CCEI and others in the business of converting biomass to chemicals have been developing what are known as 'drop-in materials' that can be used as a direct replacement for conventional products obtained using petroleum," said Saha. "But biomass processing is expensive so methods must be economically viable to be adopted." Biomass is plant material that has been broken down from a solid into a liquid. Biomass building blocks, however, are small molecules that contain only a few atoms of carbon. In order to replace the high-carbon molecules found in cosmetic oils or lubricants, these lower carbon molecules must be "coupled" or stitched together to create renewable, high performance products that offer a big payoff over their petroleum-based peers in terms of applications, toxicity and environmental effects. At RiKarbon—which means revolutionizing the carbon—the research team combines carbon molecules from natural oils, such as vegetable or coconut oil, with those from plant material, known scientifically as lignocellulosic biomass, from corn husks, grasses or trees through an energy efficient reaction to create larger molecules. The researchers use novel catalysts to accelerate chemical reactions that allow them to stitch the available carbon from these molecules together and use it for something new, in this case, the renewable oil. The team recently received $150,000 in funding from the U.S. Small Business Administration's Small Business Technology Transfer (STTR) program-Department of Energy, an injection that will enable the team to work on developing environmentally acceptable lubricants for hydropower, a low-carbon source of electricity production. Getting a startup company off the ground is not a solo journey. It requires more than an idea and a determination to take academic lab research to the marketplace, Saha said, pointing out many others across campus and the state who have supported RiKarbon's success behind the scenes. Participating in Horn Entrepreneurship's Blue Hen Proof-of-Concept program, for example, helped the RiKarbon team connect with others to learn about creating a startup company, refine their presentation skills and apply to participate in the National Science Foundation (NSF) Innovation Corps (I-Corps) program, which helps scientists and engineers that have technologies with potential to grow from the university laboratory toward commercialization. Armed with $50,000 in NSF funding, the RiKarbon team will participate in I-Corps in winter 2019. Then there were the lengthy discussions with tech transfer professionals at UD's Office of Economic Innovation and Partnerships where Saha got up to speed on invention disclosures, patentability, licensing and the technology's value in the marketplace. The Delaware Small Business Development Center assisted the RiKarbon team, too, in developing its website, conducting market research and understanding business logistics. Finally, a $50,000 Entrepreneur Proof of Concept (EPoC) award from the Delaware Bioscience Center for Advanced Technology, supported by the state of Delaware, will help RiKarbon expand new product discovery. "Without all of this help, RiKarbon wouldn't be where it is today," said Saha. Currently, Saha is working with several companies to evaluate and test 100 percent bio-based renewable oils in the current product formulations used in personal care products and lubricant applications. So far, early feedback has been positive, and things don't look to be slowing down anytime soon. "We have hired two employees, leased space in UD's STAR Campus incubator and are considering ways to scale up the product," said Saha. In other work, Saha is working on technologies to power the aviation industry with bio-based fuels. He was recently appointed to the Biomass Research and Development Technical Advisory Committee (TAC), a bioenergy consortium comprised of subject matter experts and decision makers from state and federal agencies, where he hopes to contribute information on future bioenergy needs, with an eye toward the bioeconomy.